In 1903, an elephant named Topsy was electrocuted on Coney Island, and ever since, this bizarre execution has reverberated through popular culture with the whiff of urban legend. But it really happened, and many historical forces conspired to bring Topsy, Thomas Edison, and those 6,600 volts of alternating current together. 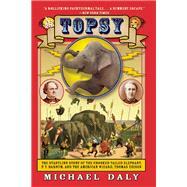 In Topsy, Michael Daly weaves them together into a fascinating popular history. The first elephant arrived in America in 1796, but it wasn’t until after the Civil War that the circus entered its golden age, thanks especially to P.T. Barnum and Adam Forepaugh (or 4-Paw). With fantastic detail, Daly brings this world to life: caravans, crooks, and side-shows. And he captures the life of the animals, both the cruelties they suffered and, when treated with kindness, their remarkable feats. Rich in period Americana, and full of larger-than-life charactersboth human and elephantTopsy is a touching, entertaining read. Michael Daly has been a newspaper journalist and columnist for many years, currently at the Daily Beast. He is the author of The Book of Mychal: The Surprising Life and Heroic Death of Father Mychal Judge about his friend, an NYFD chaplain who died on 9/11. In 2002, Daly was a finalist for the Pulitzer Prize for Commentary. He lives in Brooklyn.